Bengaluru: With over three lakh applicants seeking seats in premier schools under the Right of Children to Free and Compulsory Education Act (Right to Education) in 2015, the State government plans to give preference only to children of BPL families next year. Minister of State for Primary and Secondary Education Kimmane Ratnakar said steps would be taken to ensure seats to children of eligible families under the RTE. Parents would be directed to submit only one application seeking a seat in one school. And, admissions would be given in schools that are located close to their residences, he added. Bengaluru: Minister of State for Primary and Secondary Education Kimmane Ratnakar said on Tuesday that if school managements were found discriminating against students admitted under the Right to Education (RTE) Act reservation quota, the State government would derecognise them. Referring to reports in The Hindu on children admitted under the quota being put in a different section, the Minister said action would be initiated if department inquiries found schools guilty. MANGALURU: As many as 15 children, along with their parents and child rights activists, held a protest inside the deputy commissioner’s office, seeking their right to education, on Thursday. 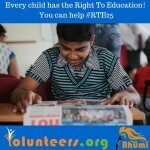 Many of them have been denied seats in private schools under the RTE quota. Parents urged deputy commissioner A B Ibrahim to make arrangements to provide seats to their wards in private schools of their locality as per the RTE Act. Five-year-old Sheetal (name changed) from Basavalingappa Nagar colony in Pachanady, about 10km from the city, wanted to join the nearest private school. However, the dreams of this dalit girl were shattered when the private school denied admission to her under the RTE quota. Her parents have been asked to visit the school on Saturday to check if she can be accommodated. The story of siblings Vikas, 12, and Akash, 11, (name changed) is also pitiable. The children, who belong to the Scheduled Caste from Soojikallu in Akash Bhavan on the city outskirts, are dropouts. None of the authorities could bring them back to school. It was through activists Dinesh Hegde Ulepady, Akshatha Shetty, U Radhakrishna Rao, Uday Kumar, Taalha Ismail, Safwan Junaid and others, 15 children, including 12 dalits, met the DC. Parents, many of whom are poor labourers, said that they did not know about the formalities of applying for seats in private schools under the RTE Act. 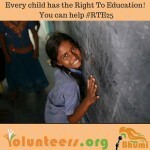 “We were under the impression that all poor children will get seats under RTE during admission. The only private school in our locality denied seat to my sons, citing the reason that we have not filed application on time,” said a mother of two boys. The DC responded immediately and directed deputy director of public instructions Walter D’Mello to make arrangements to admit poor students to nearby schools immediately. D’Mello rushed to the DC’s office and assured protesting children, parents and activists that he will take initiatives to admit children in nearby schools. “I will write to the director of public instructions department to provide seats under RTE for children,” he added. Bengaluru: In open violation of the RTE Act rules, a school here is collecting fees from students admitted under the 25 per cent reserved quota and is even issuing chalans for the same. RTE quota students at Goodwill Girls High School in Fraser Town have been paying fees every year ever since they joined the school. A parent, whose daughter is in class 3, said the school had been collecting the fees right from class 1. “In class 1, the school collected about Rs 2,000 and in the class 2, about Rs 5,000. In class 3, it hiked the fees to about Rs 6,000. If we do not protest now, it will go on increasing the fees next year and the year after that,” said the parent, who refused to be named, fearing action from the school. Deccan Herald has a copy of the chalan issued to the student, which asks her to pay Rs 6,136 under heads such as ‘administrative charge, uniform, books, computer, infrastructural development and others’. Similar chalans have been issued to several other students admitted under the 25 per cent quota. Another parent, whose daughter was admitted under the RTE reserved quota in class 3, said that the school charged regular students Rs 13,000 and those under the RTE quota Rs 6,136. “The school stopped admitting students under the reserved quota from this year,” the parent added. Speaking to Deccan Herald, Vani, the headmistress of the school, said: “We are not charging any tuition fees for these students. The amount being collected is meant for books and uniform. In any case, the government hasn’t reimbursed us for admitting students under the RTE quota for the last two years.” The State government pays Rs 11,848 for each student in class 1 and Rs 5,924 for those in the pre-school level. A number of schools have complained about the delay in reimbursement. Niranjan Aradhya V P, Fellow, Centre for Child and Law, National Law School of India University (NLSIU), said the school’s action in collecting fees amounted to a “gross violation” of the rules and an “injustice” to the students. V Ramesh, Block Education Officer, North Zone-3, under whose jurisdiction the school falls, said a committee had been formed to look into the matter and a report would be prepared in a few days. Bengaluru: The allegations of Right To Education (RTE) Act being misused by those who can afford to pay for their children’s education, while the deserving being left out, is not uncommon. In one incident that came before the High Court, parents took some very desperate measures to get their child enrolled in a school. The case came up before Justice HG Ramesh. A six-year-old, represented by her father, B Shankar, approached the HC, after a city school denied her a seat, despite it being allowed by the education department. Apart from the education department and its officials, the Vidya Samskar Public School in Machohalli, was made the respondent. The government advocate told the court that the child was allotted the seat on the basis of an application where she was described as a ‘street child’. But this was definitely false. The girl’s advocate, too, did not dispute the fact that she was not a ‘street child’. The court said that the allotment made was based on a false representation and therefore the school denying the admission, cannot be faulted. The petition by the girl was dismissed. 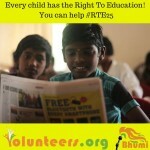 * In Karnataka, the eligibility for RTE seats is that the child should be from ‘disadvantaged groups,’ or ‘weaker sections’. * Children from castes and communities which are not in the disadvantaged categories but whose parents/guardians have an annual income less than Rs 3.5 lakh. * Out of the 25 percent seats in schools reserved for RTE students, 7.5 percent is for scheduled castes and 1.5 percent for scheduled tribes. The remaining 16 percent is for other categories. Bengaluru: The Department of Public Instruction allotted 17,198 seats under the Right to Education (RTE) quota for 2015-16 in the second and final round of online seat allotment on Monday. For 2015-16, the total number of seats available under the RTE quota is 1,11,073. Of this, 84,155 seats were allotted in the first round. A little less than 10,000 seats remained unfilled. Officials said messages have been sent to parents of children who have got seats. “They must go and get their children admitted to the schools by producing necessary documents before April 30,” an official said. After April 30, no children will be admitted. Bangalore: In yet another chance to parents and children who have sought admissions under RTE to the next academic year but were let down, Lokayukta Justice Y Bhaskar Rao has directed the brass of the department of public instruction to receive grievances of parents and redress them. He was hearing several petitions from parents stating that applications of their children were not being considered even though they were entitled for admission under the Right To Education Act. Justice Rao, who had summoned Mohammed Mohsin, commissioner for public instruction, K Anand, director for public instruction, and Manjunath, deputy director for public instruction, to his office, directed them to ensure that the respective BEOs received the grievances of parents whose wards were refused admission, and have the cases decided on merit within 24 hours. “The aggrieved parents can meet their respective block education officers and put forth their grievances. After grievances are redressed, these BEOs will send the lists to the commissioner through DDPI on or before Thursday, April 30, 2015. In case a school refuses to admit an eligible child, it is liable for prosecution/action under law. It is open to the authorities to take action after giving a window of 24 hours to erring schools to act, and then initiate action as per law,” Syed Riyaz, Joint Commissioner (PR), Karnataka Lokayukta, stated in a release. BENGALURU: The online lottery system for allotting the final seats under the Right to Education (RTE) quota in private unaided schools has turned out to be a mess. As per documents available from the schools in the city, many ineligible students have been allotted seats. Last Thursday, the Department of Public Instruction held the online lottery for allotment of seats using a software application. Lokayukta justice Bhaskar Rao launched the process and assured the applicants of complete transparency. However, according to documents available, most of the candidates who were allotted seats had been earlier rejected by department officials for various reasons. Students who do not belong to the ward have been allotted seats, candidates who did not qualify age wise have got seats, and students with second preference have got seats in the first round itself. Moreover, those who had been rejected at the application level itself have got seats. “How can we trust this process?” asked Shashikumar. “A student from Nelamangala was allotted a seat in a Dasarahalli school. How does this fulfil the RTE criterion of neighbourhood schools?” he questioned. According to the schools, reserved categories have been allotted more seats than the percentage reserved. “In our school, three seats were reserved for SC/ST category. But over eight candidates have been allotted seats. Parents are putting pressure on us to admit them,” said the principal of a city school. Considering the lapses, the KAMS plans to approach the Lokayukta and file a complaint on Tuesday. The number of applications received for admissions under the Right to Education (RTE) Act quota in the State is more than double the seats available, with 2.57 lakh applicants vying for 1.11 lakh seats. Many parents may be unable to obtain seats for their wards due to the high demand. While some private schools have received over 650 applications for RTE quota seats — resulting in one seat being contested by almost 20 applicants, there some schools with no takers for the seats. As many as 223 schools across the State having a total of 1,120 seats have not received a single application. Lokayukta Y. Bhaskar Rao along with Minister of State for Primary and Secondary Education Kimmane Ratnakar and department officials inaugurated the online lottery system for seat allotment on Wednesday. About 1.31 lakh applications were rejected as there were duplicate and incomplete applications. With parents having the option of applying for more than one school, the total number of options exercised by parents is 5.76 lakh. The highest number of applications has been received in Sharanbasaveshwar Residential School in Kalaburagi — 673 applications for 113 seats. The list of the top 50 schools that received the highest number of applications, prepared by the Department of Public Instruction (DPI), reveals that 33 of them are in Bengaluru North and Bengaluru South districts. Officials say that high number of applications in these schools can be attributed to the location advantage as there may not be any other “good” school in the locality. Some schools in Bengaluru have received around 700 applications, however their names do not figure on the list prepared by the department as officials say that multiple and incomplete applications filed by parents were weeded out. Around 1.19 lakh applications, of the total 3.89 lakh, have been rejected for the same reason. Parents will get a message about the seat allotment and they can get their children admitted in schools after March 20. The department will also conduct more rounds to fill vacant seats. BENGALURU: In 30 minutes flat, the department of public instruction (DPI) completed the allotment process for seats under the Right to Education (RTE) quota. By 6pm on Wednesday, parents of the selected children received SMSes informing them of the development. As many as 1.11 lakh seats in private schools were allotted through the online lottery system, which has been implemented for the first time. In previous years, the process was carried out through a manual lottery system. Details of eligible RTE were jotted down on chits, which were put it in a box. Names were selected through a lucky dip. The practice was time-consuming and often misused by some well-to-do families, who walked away with RTE seats in private schools after producing fake income certificates. The online system aims at checking the malpractice. Under the new system, the software allots an ID to each applicant. It gives first preference to applicants from families with an annual income of less than Rs 1 lakh, then to those with an income of Rs 1 lakh to Rs 2 lakh and subsequently to those with income of Rs 2 lakh to Rs 3.5 lakh. For 1,11,329 RTE seats in 11,202 private schools, DPI had received 3.89 lakh applications. The software scrutinized 2.58 lakh valid applications, said primary and secondary education minister Kimmane Ratnakar after launching the system on Wednesday. Many complaints of favouritism were received after the manual process was conducted last year, the minister pointed out. The seats were allotted in the presence of Lokayukta Justice Y Bhaskar Rao, who had earlier taken up suo motu investigation into complaints about wealthy parents grabbing seats meant for poor students. “It’s a good move to ensure transparency. The Lokayukta will continue to monitor the working of the online system,” said Justice Rao. “About 40% of these seats pertain to schools in Bengaluru. Though many high-profile schools are yet to fall in line because they have challenged the system in the Supreme Court, the overall number of seats has increased by about 20% compared to last year,” Mohammed Mohsin, commissioner of public instructions, told reporters.